I have never felt this passionate about a shoe in a long time. Well, since this. I mean, I love shoes. Like, all the time. But the desire to have this particular pair is driving me nuts. Yes. 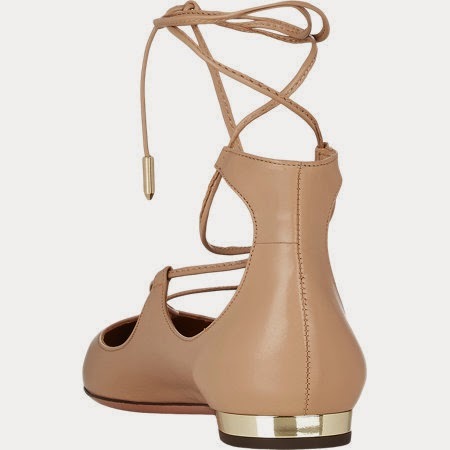 I have a love-hate relationship with the Aquazzura Christy in Biscotto. I love the shoes. I hate that I want it. That my shoe obsessions never stop. I wonder when I can talk about shoes with detachment you know. 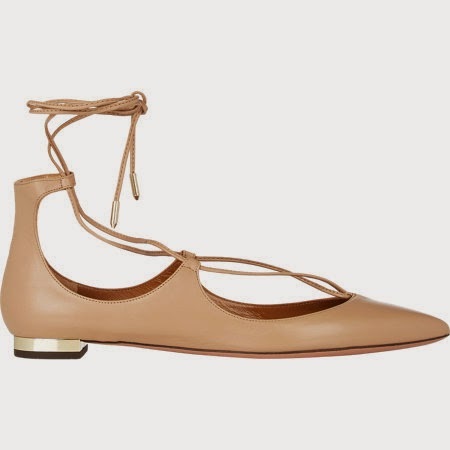 Like the kind of girl who'd say, "Who needs another pair of leather cobbled together to protect my feet when I walk? I'm happy with my Aerosoles." But the thought of owning this pair is bordering on the insane in the membrane levels. We're talking so many months of obsessing about this shoes na. When I have the free time to daydream, this is what I obsess about. If there was a 360 degree view of these shoes, I'd be inspecting each degree. I've always liked Edgardo Osorio's design aesthetic. But since I don't really wear heels, I was always just admiring from afar. A healthy respect sort of thing. Like, I would pin his Amazon heels on my Pinterest board and leave it at that. When he came out with the Belgravia flats, it didn't do too much for me. Found it too strappy around the ankles, which I know will only work for those blessed with long legs. When I spotted the Snakeskin Fringe heels on sale at net-a-porter, at a steal that was crazy to walk away from, I still walked away. But these darn Christy flats! Covet levels! And who can't resist a brand with a pineapple in it's logo? It's just too darn cute. But I promised myself that this year, and I really mean it this time, that I will only be spending on investments. Hey, I am talking in finance parlance. Of course, there is one tiny loophole hehe. I will get to reward myself when my investments make me loads of money. 2015 is about Discipline. Frugality. Self-control. You know, responsible adult values? Heehee. I know, I sound really cuckoo rambling on and on about a shoe. Luckily for now, this color is sold out everywhere that even if I am caught in a moment of weakness, I won't be able to get my hands on a pair. Biscotto or Black? My heart tells me, Biscotto! But the true test happens when this style in this color gets restocked once again. I wouldn't know whether to rejoice or be scared about what I am capable of. Whether I cave in down the road, or earn a windfall to warrant a purchase, remains to be seen.